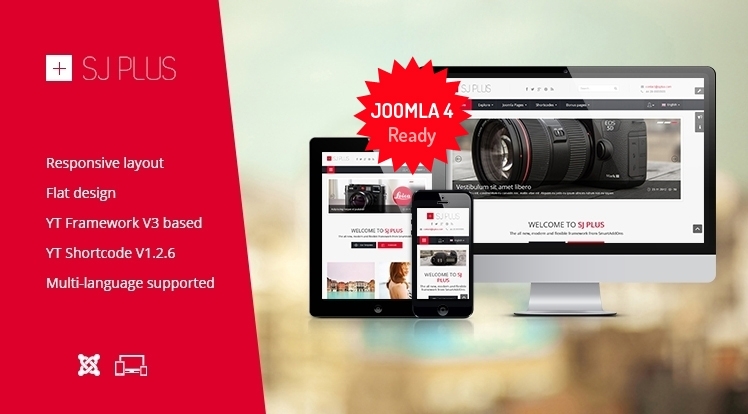 SJ Plus - a TOTALLY FREE template for Joomla community. The template is designed with bootstrap, responsive layout, SEO optimized and LESS. This free joomla template used most innovative designs and code libraries to bring developers a powerful and flexible template, but FREE entirely! With support from in-house modules, that are provided free as well, we can use this as a base for building high quality Websites based on Joomla! We used cool modern style with many extra pages, each has custom styles in order to suit various types of page that you would build with 3rd extensions such as membership Join now page, Portfolio listing page, Gallery page... Integration now become quicker and easier. With front-end Cpanel, SJ Plus is very easy to set style for content through parameters right out of the box without effecting the Database. Using content component, allowing you to post articles with many featured details, along with many extensions has been developed in-house, SJ Plus can display carousel, tabs or custom stylized content that are suitable to various contexts ranging from personal Websites with social profiles to business Websites with very high traffic. By used latest web technologies like HTML5, CSS3 and SHORTCODES in-built, Sj Plus V2 is extremely simple for you to design and customize your own website. Specially, YT Frameworke v3 allows you to add custom code to some special positions of webpage: <head>,<body>,... as well as create Fancy menus with a moving gooey background effect and support Sidebar menus on Mobile, Tablet. For special positions such as: sticky_left, sticky_right, notice, tool_bottom... styles and effects are also supported. Furthermore, SJ Plus V2 is updated with YT Shortcode v1.2.4. You can easily reduce repeating regularly used pieces of code as well as add, accomplish many extra fields without much coding knowledge. Discover SJ Plus V2 main features now!